Seen these fellas before, no mouth to be seen. They just like hanging around my tom's. If they don't eat the leaves I would say a good guy!Lots of the beetles types like that eat the bad insects! It doesn't look like a beetle to me, more like a fly. In fact, it looks rather like what are sometimes known as "leather jackets" in some areas. Kind of like an extra-large mosquito type thing. If I recall correctly, the adults don't eat, but the larvae eat grass roots. They are known by other names, too, but this might give you a place to start your research. Adult crane flies feed on nectar or they do not feed at all. 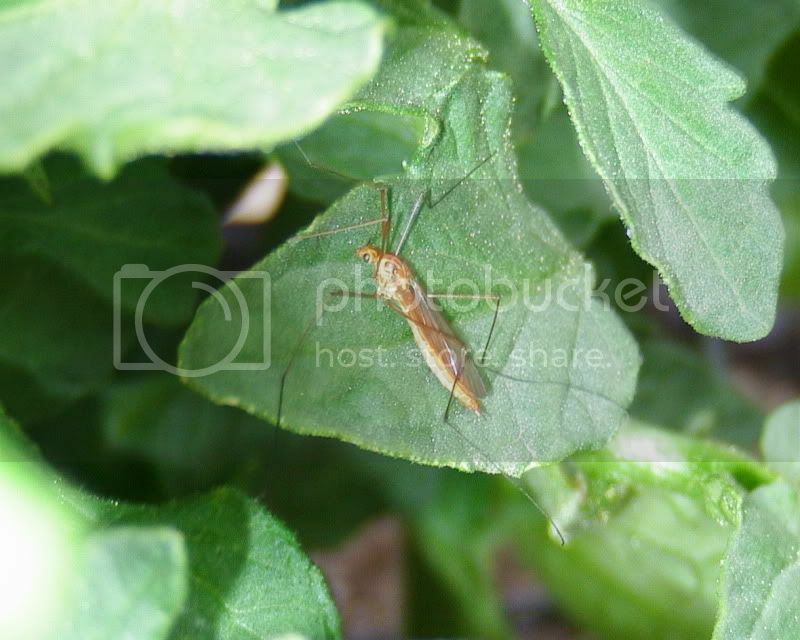 Once they become adults, most crane fly species exist as adults only to mate and die. Their larvae, called "leatherjackets", "leatherbacks", "leatherback bugs" or "leatherjacket slugs" because of the way they move, consume roots (such as those of turf grass) and other vegetation, in some cases causing damage to plants. But unlike other grubs/ worms, I have never seen the crane fly larvae to be a serious pest in the garden. It must be the crane fly. I was going to suggest that earlier, but the sources I saw looked somewhat different. Must be a regional thing. I didn't think they would be a foe, but just wanted to be sure-they are really close to the baby tomato and flowers.